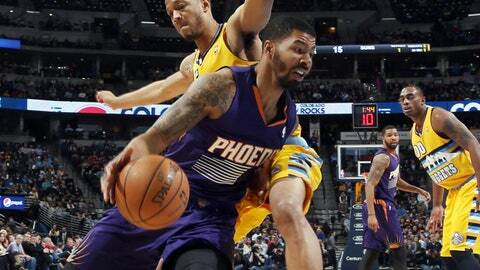 Markieff Morris tries drive past Nuggets forward Anthony Randolph during the first half of the Suns' 103-99 win. DENVER (AP) — Markieff Morris found himself on the bench after he didn’t hustle back and allowed a dunk in the second quarter. That certainly got his attention. Next time in, Morris played with way more determination. Same with the rest of the Phoenix Suns. It was the only way to erase an early 21-point deficit. Morris scored 25 points and Gerald Green added 19, helping the Suns rally for a 103-99 win over the Denver Nuggets on Friday night. "We never quit. We came out and fought all the way to the end," Morris said. "It’s a great feeling, man." It was hardly one player, either, and the reserves played a big hand, too, outscoring the starters 64-39. "That just goes to show you what type of team we have," said Green, who tied a career high with six 3-pointers. "Some nights are not going to be everybody’s night. Any given night, somebody can step up on this team and help us win. That’s what it takes. "That shows a lot about our character." And once the Nuggets spread out their defense in order to stop the long-range shooting, Goran Dragic went to work by driving the lane. He finished with 17 points, including two big layups down the stretch. Steadily, the Suns worked their way back into a contest that looked all but over, especially with the Nuggets up 79-62 with 4 minutes left in the third quarter. But Suns coach Jeff Hornacek kept them on course, kept their confidence high. That did the trick. "I’ve got to give coach the credit, he never panicked. He never yelled at us," Green said. "He just kept with it, kept telling us to stick with the plan and it’s going to work." Wilson Chandler had 15 points for the Nuggets, while J.J. Hickson added 13 points and 14 rebounds. Ty Lawson was in the lineup despite coming down with a stomach bug on Thursday. He was slightly off his game, shooting 3 of 11 and finishing with 13 points. "They were down 21 points but they kept fighting," Denver forward Darrell Arthur said. Phoenix tied it 88-all on a layup from Ish Smith — his only basket of the game — with 8:21 remaining. Soon after, the Suns took their first lead since scoring the opening bucket when Dragic dribbled past Denver defenders for a layup. From there, it was back and forth until a pair of free throws and a layup from Dragic gave the Suns a four-point lead. With a 102-99 advantage, Phoenix allowed Randy Foye to get a good look at a 3-point attempt, but Foye was off target with 5.9 seconds remaining. Morris sealed the win by making a free throw. A demoralizing loss for the Nuggets as they lost their second straight game at Pepsi Center to drop to 7-5 at home on the season. They were a franchise-best 38-3 last season. "I’m not very happy, and I’ll take the hit for tonight’s game, for allowing some things in practice to carry over into the game," coach Brian Shaw said. "When it was going good for us in the first half, we were all smiles and played as if the game was over and didn’t have a second half to play." Dragic and fellow guard Eric Bledsoe entered the game averaging more than 18 points apiece. They combined for 27, with Dragic’s biggest buckets arriving down the stretch. "We were hitting those 3s. Then, their players, they were afraid to be in the paint, to leave open our shooters," Dragic said. "It’s much easier when you have more space in the paint — you can create. We did that." At 15-10, the Suns may just be ahead of schedule in terms of turning around a team that had the worst record in the Western Conference last season. "We’re winning some games against some good teams and that’s giving them confidence and helping to speed up the process a little bit," Hornacek said. NOTES: Both teams return to the court Saturday night. The Suns host the Dallas Mavericks, while the Nuggets play the Clippers in Los Angeles. … Shaw knows Hornacek a little bit from their NBA playing days. Any tales to tell? "No stories," Shaw chuckled. "(Hornacek) was just always a player that you had to respect and had to honor what he could do out there on the floor." … The Nuggets’ Jordan Hamilton served his one-game suspension for throwing a punch at Oklahoma City center Steven Adams on Tuesday.